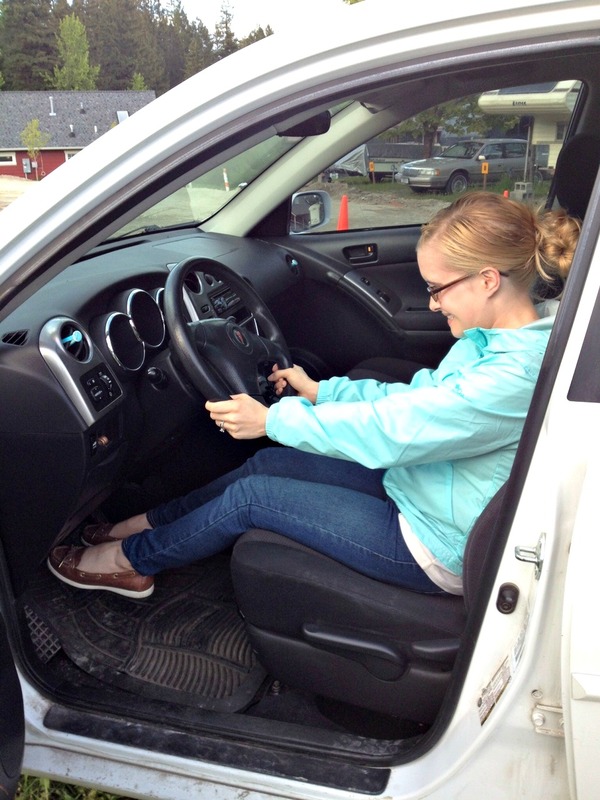 pint-sized mama: Pint-Sized Moments: How to Drive When You're 4'8"
Pint-Sized Moments: How to Drive When You're 4'8"
Since you're only 4'8", how do you drive? Do your feet even touch the pedals? 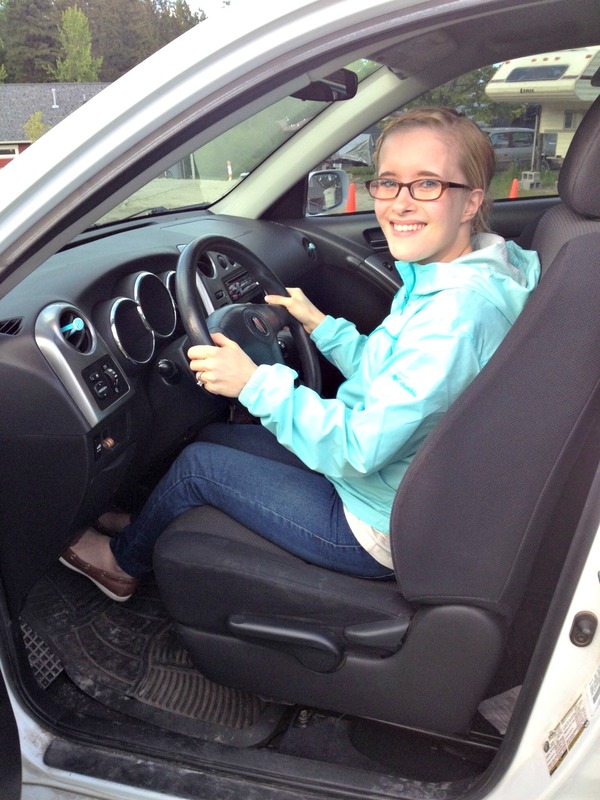 I do drive, although I kind of look like a little old lady whose nose is barely reaching over the steering wheel. So I have to make a few modifications! It's hard to see over the steering wheel, and my feet can't reach the pedals. I compensate for that by pushing my seat really far forward, but that is a little scary because it means that my face is extremely close to the steering wheel. 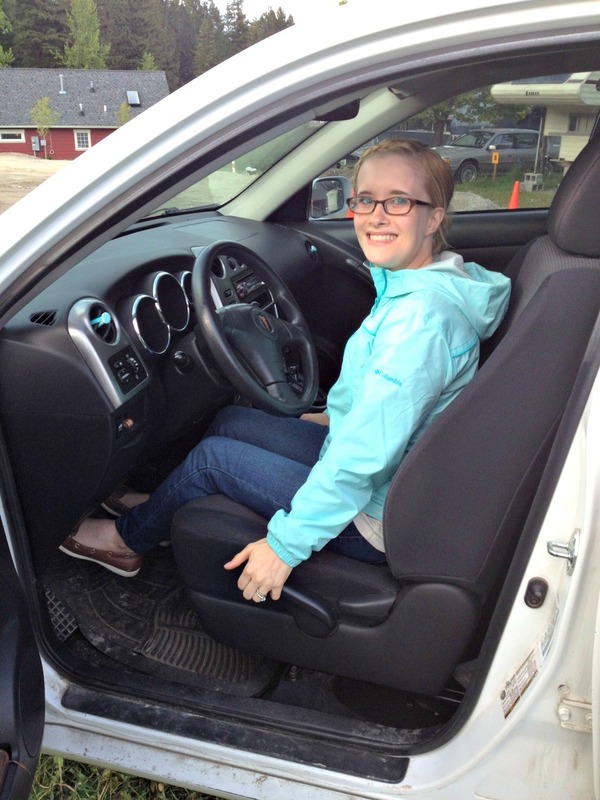 We recently chose our Pontiac Vibe for several reasons, including the fact that the seat moves upwards - so I that I can see over the steering wheel and the back seats! The picture below shows me in the driver's seat before making any modifications for my height. This is me straining to reach the pedals with my tip-toes. This isn't very safe considering that I can barely push the brake down or push on the gas. I love that in this car, I can use the handy lever on the side of my seat and pump my seat up high enough to see over the steering wheel! I also can move my seat close enough to reach the pedals. Here is the final product. Much more compact than before, but it works for me! When I drive and my husband sits in the passenger seat next to me, he feels like he's sitting in the back seat because my seat is so much further forward than his. :) Sitting so close to the steering wheel was also a problem when I was pregnant with Nicholas. My belly was huge from early on in my pregnancy, so sitting close to the steering wheel meant there was no space for my giant belly to fit! Needless to say, I didn't drive at all in my 3rd trimester. The only thing left to do for a more "normal" driving experience is to get custom pedal extenders. I hope to get these soon, so that I don't have to sit so close to the steering wheel (and the scary airbag!). I'll let you know when I do - I'm sure that will be a monumental day for this pint-sized driver! I tell ya, it's always an adventure to be me. I loved reading this post! I'm 4'9" and have a ten month old little girl. 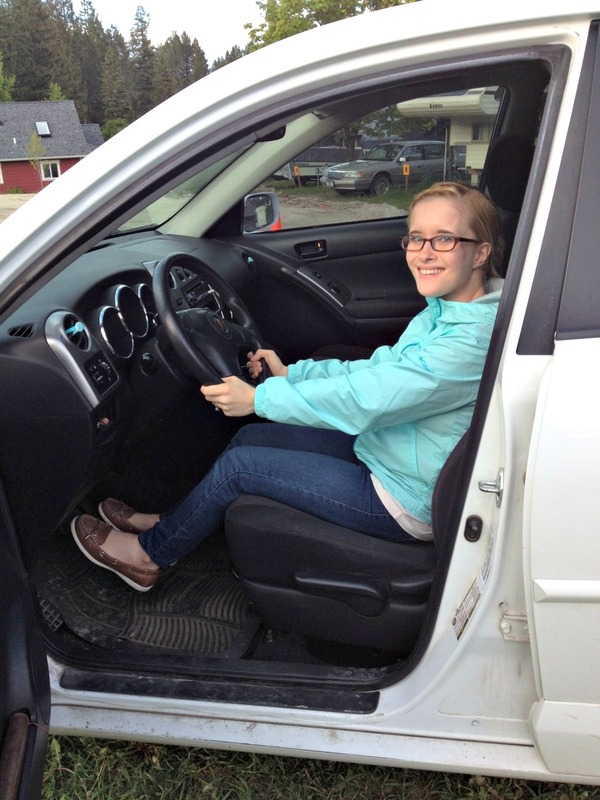 I just recently got my learner's permit but am terrified being behind the wheel because I can't really see! Unfortunately, my husband's car seats do not adjust up, :(. Are there adult booster seats or something? I was hoping to get better at driving so that I can get my driver's license by the end of the summer. Any ideas?